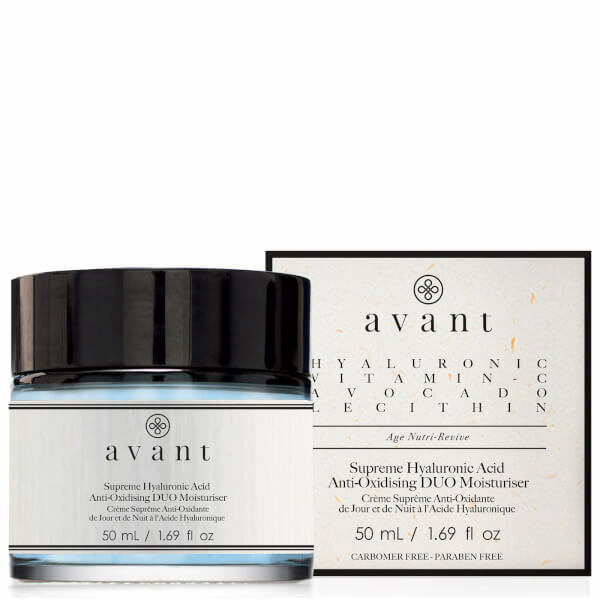 Reveal soft, radiant skin with Avant Skincare's Supreme Hyaluronic Acid Anti-Oxidising Duo Moisturiser, a deeply hydrating formula specially developed to help ease and prevent signs of ageing. Part of the brand's Age Nutri-Revive range, the anti-ageing moisturiser has been formulated to nourish skin from within and combat enlarged pores, uneven tone, fine lines, dullness, dryness and weakened skin. 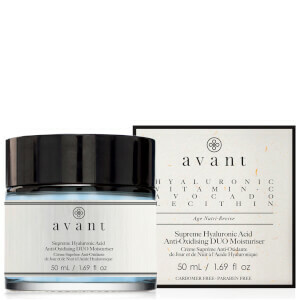 Its dose of signature Hyaluronic Acid and Vitamin C help to plump skin with moisture and restore a natural glow, while Jojoba and Avocado Oil hydrate and soften with their humectant properties. Apply the moisturiser, working from the chin towards the earlobes. Smooth from nose to temples. Massage into forehead, making smoothing movements from the centre of the face outwards. Massage, making circular movements from eyebrows to nose, avoiding the eye contour area. Combine with a eye serum or cream for a complete routine.